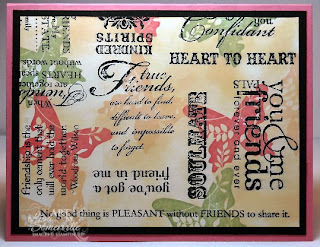 When I first purchased the Friendly Words Wheel, I thought it would be great to use the sentiments on a variety of cards, so I bought a second wheel, and unmounted it from the wheel base. It's pretty easy to unmount the rubber from the wheel, simply peel at the seam and pull off the wheel base. Once I did this, I carefully cut the sentiments with my Craft & Rubber Scissors, giving me 13 different sentiments. This first card shows the Friendly Words Wheel stamped in black. I then added the butterfly from Great Friends in Celery, Apricot and Rose, stamping randomly on my stamped words. Then lightly sponged the background with Apricot Ink. 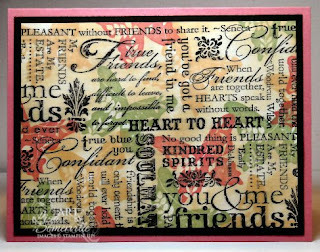 On this second card, I used my unmounted version of Friendly Words, randomly placing the sentiments on my large acrylic block (covered with Tack N Peel), stamping in Black on White card stock. This time when stamping the butterflies from Great Friends, I left a bit more space. ETA - You can read more about Tack N Peel here. I use Tack N Peel with all my unmounteds, this eliminates the need for foam, as the Tack N Peel is a double sided adhesive that you place right on your acrylic blocks. What a great idea. I recently purchased the wheel thinking I'd just use marker to stamp the words I wanted, then thought what was I thinking. Thanks for the tip and is it really that easy to unmount? So smart!!! I like the original but also love the space you created. I think it's time to copy you again and order a second one for me!!! Wow, those cards are gorgeous! And what a great idea of unmounting the wheel. Thanks for sharing all of it! 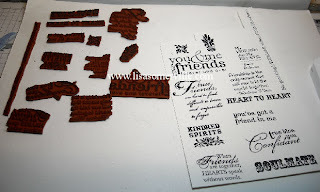 Love what you did here - I have cut up wheels before - but did not think of slipping up those into individual stamps. Great idea. I heard about this idea but couldn't find the link that talked about it--thanks!! I understood from the friend that told me about it that they mounted each sentiment on a foam piece....it sounds easier to do it the way you said. What is tack and peel and where do you get it?? LIsa, I really love these! Just gorgeous! Excellent!! You' ve always been good at spending my money.... This is beautiful!